Bruxism is the unconscious habit of clenching or grinding teeth, often during sleep. While there are several possible causes – for example, a misaligned bite or sleep problems – chronic stress is easily the most common. And bruxing is more than a mere annoyance. Over time, all that extra pressure can contribute to gum recession, tooth erosion and breakage, TMJ problems, headaches, and pain through the face, jaw, neck and back. A night guard offers one good solution, providing a barrier between your upper and lower teeth to cushion the force and protect them. While over-the-counter devices are widely available today, for comfort, effectiveness and durability, custom-fit devices are the smarter way to go. They may cost a little more, but patients routinely find that the better results are worth it. 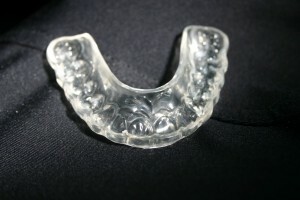 Splint therapy is another effective way for dealing with bruxism. This type of custom-fit device not only cushions and protects your teeth but also helps relax the muscles of your mouth and face, weakening the clenching habit.